Updates and news on how technology is changing in Manhattan College. Google Drive Sync ends support on December 11, 2017. Install Google Drive Stream. 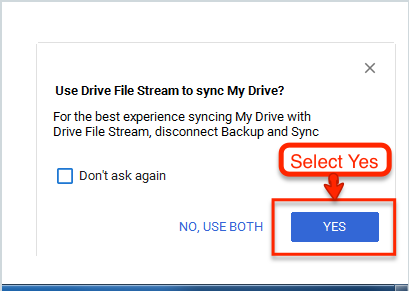 At the conclusion of the installation, you will get a pop up asking whether you want to replace Google Drive Sync with Drive Stream or whether you want to use both. It is recommended that you select "Yes" indicating that you wish to replace. Drive File Stream is a new way to access all of your Google Drive files directly from your Mac or PC, without using up all your disk space. Unlike traditional file sync tools, Drive File Stream doesn’t require you to download your files first in order to access them from your computer. Instead, when you need to view or edit a file, it automatically streams from the cloud, on-demand. With Drive File Stream, your team will spend less time waiting for files to sync, no time worrying about disk space, and more time being productive. Quickly see all your Google Drive files in Finder/Explorer (including Team Drives). Browse and organize Google Drive files without downloading all of them to your computer. Choose which files or folders you'd like to make available offline. Open files in common apps like Microsoft Office and Adobe Photoshop. Visit the Drive Help Center to install Drive File Stream and get started.